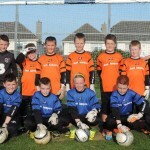 Goalkeeping gloves, goalie gloves, goalkeeper kit, goalkeeping equipment. Everything for the goalkeeper – welcome to goalkeeper gloves for sale catering for your goalkeeper training and goalkeeper match play needs. The main difference with Just4keepers to the majority of other online stores is that www.goalkeepergloves.ie is a store ran by goalkeepers, for goalkeepers. So because we are keepers ourselves we make certain that our prices are very fair and a J4K glove that is €45 for example, would be €70 plus in another dearer brand. So with the J4K goalkeeper gloves you are getting high specification glove, for a very decent price. This is why our goalkeeper glove is becoming so popular within the goalkeeping scene globally. The BIGGEST difference with J4K, is Just4keepers started off as a goalkeeper coaching schools in 1999 and is now the leading goalkeeping academy globally. And the reason why J4K launched their keeper glove range is because we wanted to service our students Internationally because they were getting fed up paying high prices for their goalkeeping gloves. However because goalkeepers worldwide see that J4k is trying to offer something unique and different, J4K is now just as popular with non J4K students. Finger protection goalkeeping gloves offer the goalkeeper hand protection from dangerous shots and these gloves have become very popular in recent years. However J4K is not a lover of finger save gloves but we do offer them in our range fingersave goalkeeper gloves (“fingersafe gloves” as some people call them are not our cup of tea but check out our full range here! Good childrens goalkeeper gloves are hard to find because a lot of brands use cheaper specification in junior goalkeeper gloves. Sadly most young goalkeepers buy the goalie gloves they see their favourite professional goalkeepers wear and think they have bought the same glove. Unfortunately this is not the case! However the great news is with the J4K Goalkeeper Gloves, if you buy a pair of the J4K gloves you see the pro goalkeepers wear, you will be buying exactly the same glove with Just4keepers. This is very important to note! Also just because we have cheap goalkeeper gloves for sale on our website, please do not think we use cheap specifications on our goalkeeping gloves because this is not the case. Even though our gloves are priced fairly, please be rest assured we use quality specifications. Goalkeeper kit is very important to any goalkeeper so please check out our Goalkeeper pants, goalkeeper trouser, padded goalkeeper shorts and goalkeeper shirt as we offer fair prices on our apparel range also. It has been an honour helping young goalkeepers worldwide with our goalkeeper training schools as J4K is unrivalled globally, so we are now just as honoured to help goalkeepers (and their parents) save money on their goalkeeping gloves and hope to provide something very unique with the Just4keepers goalkeeper gloves and within the goalkeeping scene worldwide.